by "Rose-chan" (Stephanie) and mom "Foxwzrt"
My mom, my friend, and I all started our journey on November 28 setting off from Primm Nevada after a pleasant night of rest. Our first stop was the Janet Terminal at McCarren Airport. Since it was Thanksgiving weekend the parking lot was pretty empty and not much was happening. When we had been there before it was buzzing with activity, but now it sat silent. One of the entrances was even chained off. After taking a few quick pictures we set off toward Rachel, Nevada. We first stopped at the ET Highway sign and then continued passed Groom Lake Road to the Mailbox where I lovingly left my mark. I left a dollar in the Alien Drop Box so he could buy some paint. It was covered with tagging so I figured it was due to be pained again. After that we grabbed some grub at the A'Le'Inn. The burgers were tasty and the decor fueled our excitement even more. However, the highlight of our meal was spotting Chuck Clark at the bar. First the lady at the bar tried to sell me a copy of the "Area 51 and S-4 Handbook" to which I replied I already had one. Then she said, "oh, well the author is sitting right there!" Goodness! That was awesome. So I raced out to my car and got my handbook and my camera. That was a marvelous start to our journey. We met a legend. It was great. After our meal we unloaded some of our stuff into our room, which ironically was number 5-1. Once more, we took that as a great sign our trip was on the right track. We backtracked to Groom Lake Road. I was, as I always am, the first one to spot the glare of the cammo dude truck on the hill. I think our camcorder made him nervous because he shifted his truck on the hill a few feet as we approached. We took a few pictures and waited around a few minutes to see if the bus was going to come out. Since it was a holiday weekend and we saw no cars under the trees at the highway junction, we didn't think it would come. Still we held out hope until it started getting too dark. As we drove back down Groom Lake Road toward the highway the red colors on the mountains ahead of us were so breath taking I got out of the car to take some pictures. It was amazing. Suddenly I heard our car pull away! 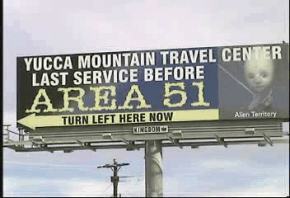 My mom had ditched me on Groom Lake Road! After about 100 feet she stopped and as I reached for the door handle she pulled away again! We played this game for about 10 minutes until she finally let me get inside. I never knew I could curse so much at my own mother. I could just imagine the Cammo Dudes sitting back on that hill laughing at us. It must have been an odd sight. Gee, thanks mom! However, to make up for it she let me take control of the wheel for a little while. 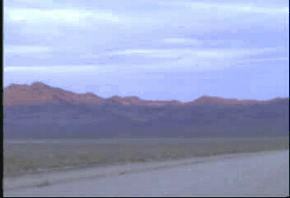 I'll never forget that I got my first driving experience on Groom Lake Road. It is altogether fitting considering the UFO nut that I am. Then we went back to our room and watched some UFO videos from the Inn. One of them was narrated by Scotty from Star Trek. That was odd. Our guest fell asleep during the video, but I found it very informative. They have a wonderful video selection at the A'Le'Inn. I can't wait to go back just to watch them. The next morning was going to be our last morning in the Rachel area so we started off early. First we visited the Back Gate where we had a rather interesting experience. We first crossed an old barbwire fence that we assumed was the border. We were terrified so we stopped and took pictures from a distance. All was quiet at the back gate, as we assumed it would, thinking it suffered the same curse as the bus and the Janet terminal. However, after a few minutes the red lights on the stop signs started to flash almost as if we had triggered a sensor or an unseen Cammo Dude flipped a switch. At that point we chickened out and turned around. I watched out the back window as the Cammo Vehicle moved as if someone had gotten inside of it or stepped out. I couldn't tell since I saw no door open. The building obstructed part of our view. From that point we took the road to Timpiute where we discovered a wonderful view of the sky above the base. We could even see a dust cloud on Groom Lake Road. We loved the spot so much we have decided on our next trip we would camp there. 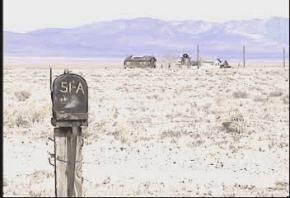 Another strange thing we found was a farm whose mailbox read "51A". Area 51 has a farm? Cool! Next, we took off toward Tonopah where we would spend the next night. Unfortunately we suffered a casualty on the way. We saw a bird fly in front of us, but not fly away. When we got to Tonopah we discovered him stuck to the grill. Poor thing. We gave him a proper funeral and I named him "Dreamy" in honor of the base. God Speed little fellow. After yet another peaceful night we took off for home. We saw a couple of interesting sights to conclude our trip. At a little truck-stop town there was a rather amusing sign pointing in the direction of Area 51 reading "Last Service Before Area 51". There was a lot of interesting merchandise there, but nothing compared to the A'Le'Inn. As we pulled out to get back on the highway a Wal-Mart truck passed us. We had hoped to see one turning down the back gate or something, but no, we see one heading toward the town of Mercury. At least that is what we assumed. We were tempted to chase it, but we were running out of time to get back. We got some pictures of the town of Mercury too. That was a rather interesting little government town complete with a control tower-looking thing. We wished we could go investigate it more, but alas we had to return home (and it is closed to the public anyway). So there ended our journey around the huge chunk of Government land in the Nevada Desert. See you in April!